I'm sure everyone at this time to know one of the biggest social networking that exists today that is Facebook. Everyone seemed hypnotized by the social networking Facebook. Even daily always busy with activities on facebook such as update status, upload photos/videos, share links, etc. But many also Facebook users who want to delete my facebook account now with a variety of reasons. Since the number of facebook users who want to delete their account then this time I will discuss on How to Delete Facebook Account. Talk about delete my facebook account is indeed these two versions. First, delete facebook account permanently and the second is only temporary. How can I delete my facebook account? First, you must sign in to your facebook account. 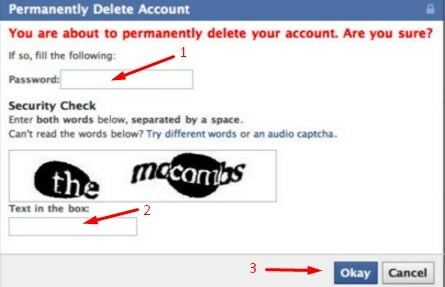 After that, For to go the next phase of how to delete a facebook account, please click the link here. You will be taken to a page of how to delete facebook. For example deactivate facebook account permanently like the image below. If it appears the look like the above picture, please click "Delete my account". And you'll see the look like the image below. Please enter a password for your facebook account on a Password column, for more details please see the column designated number 1. Next, you need to enter captcha in the column "Text in the box:", for more details please see the column designated number 2. Next, will appear notification that contains a brief explanation of the process of deletion. Try to look at the image below, if you have already read these notices, please click "Okay". 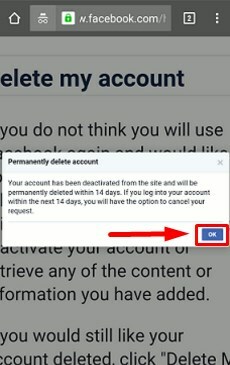 I want to delete my facebook account finished, your facebook account will be disabled before the 14 days period, during this period you can still reactivate your facebook account, however, if the passing of the deadline 14 days then your facebook account will be permanently deleted and you will not be able to access your facebook account forever. First please open a browser on your mobile phone. Next, enter this link facebook delete my account https://www.facebook.com/help/delete_account in the search column on the browser of your mobile phone. Then it will appear on your phone's display as shown below. 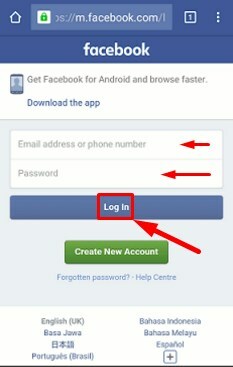 Please log in to your Facebook account by entering your email address or your phone number, then enter the password of your facebook account, then click "Log In". If you are already signed in on your facebook account, then you will be taken to the next page, as shown below. Whether you are already sure to delete your facebook account? If you are sure, please click the "Delete my account". Then you will be taken to the next page as shown below. Please enter a password for your facebook account at the column designated number 1. See the captcha code in the red box above, enter the captcha code in the designated column's number 2. 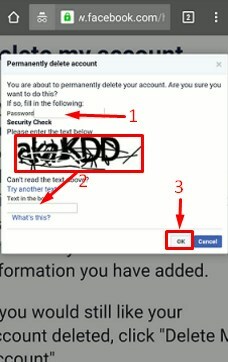 It will pop up a notification such as when you delete your facebook account via your PC, just click "OK" try to look at the picture below. Then as I explained above, your facebook account will be permanently deleted after 14 days. 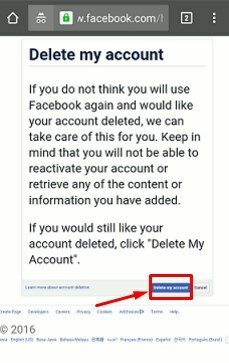 Hopefully, the both tutorial above can help you to delete your facebook account either on your PC or on your mobile phone. The above tutorial I created clearly and systematically, I hope you can follow each of the steps how delete facebook account above correctly. Good luck!